Update April 28, 2017: Following the 2.0 patch, we’ve crunched the numbers on all of this again. We’ve got some new data too – more information on how the pity timer works, plus some numbers on epic and veteran chests. Taking a leaf out of Overwatch’s book, followed by a sprinkling of Hearthstone, Heroes of the Storm has unveiled its revamped progression system. No longer are levels simply the barrier between you and playing a differently shaded hero – they’re the key to loot chests. 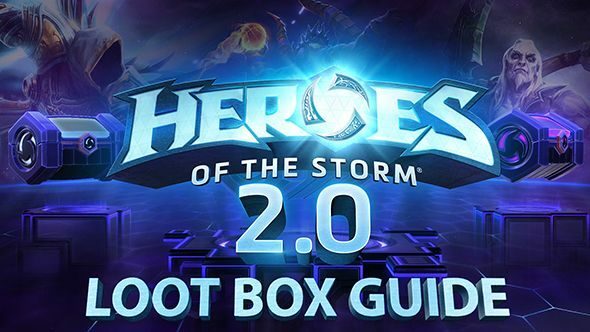 Has Heroes of the Storm’s 2.0 update inspired you to start playing? Check out our beginner’s guide! With a slew of new cosmetic items such as emoji, banners, and so on, it’s very much akin to Overwatch’s model. In each chest are four items, of common, rare, epic, or legendary rarity, which you can add to your collection. It’s not exactly the same, so we’ve gone and run the numbers: using data from a number of sources, we’ve worked out the odds behind it, what you can expect, and even how to game the system. First though, the basics. You’ll be getting a new loot chest every time you level up. Very simple, and exactly what you expect. On top of that, if you reach a certain milestone with a hero, you’ll get a chest with a guaranteed rare item for them – for example, reach level 10 with Illidan, and you’ll get a chest with a rare item for him. Before we get to the specifics, here’s the basic data you need. There are three kinds of chests: regular loot chests, rare chests, and epic chests. As you might have guessed, these refer to their contents. An epic chest will always contain an epic or legendary item, and possibly more. Similarly, rare chests guarantee at least one rare or better item. This is important because it differs from Overwatch and Hearthstone – in those game, loot boxes and card packs always give you at least one rare card. 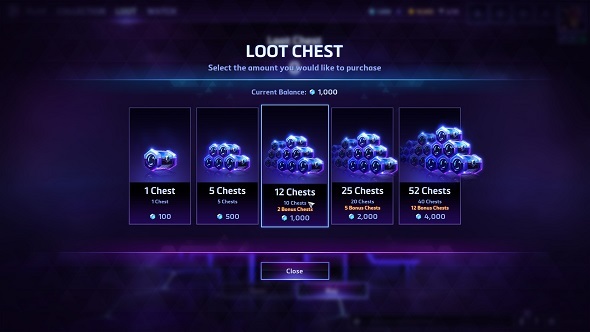 In Heroes of the Storm, this isn’t guaranteed – a loot chest may well give you four common items, if the dice rolls aren’t in your favour. Our first batch of statistics are all based on regular loot chests – these are the most plentiful and also the only kind you can buy directly right now. That said, there’s definitely some strategy to opening all kinds of loot chests. This is because Heroes of the Storm has a new system: rerolls. Each basic loot chest can be rerolled up to three times for increasing amounts of gold, the first reroll costing 250, the second 500, and the third 750. From what we can tell, rerolls are independent of the previous results, and there’s no reroll-specific weighting to get you something better or worse. If you reroll a loot chest that contained a legendary item, you’re not guaranteed to get another (in fact, it’s incredibly unlikely). So, part of what you’re here for: the actual numbers. We watched 521 loot chests being opened since the update went live, resulting in a total of 1500 common, 445 rare, 111 epic, and 28 legendary items. These numbers are slightly different to what we found on the PTR – but not significantly so. We found more common and rare items, which made up 71.98% and 21.35% of all drops respectively, but less epic and legendary items, which made up 5.33% and 1.34% of drops. The key one of those is an approximate 35% decrease in legendary drop rate to our previous findings. It sounds huge, but we did a little further digging to see if this really is a significant difference. Using a t-test, a form of statistical analysis for comparing two sets of data, we found that the difference was not statistically significant in a way that would raise further questions. 68.33% of boxes contained at least one rare item – with many containing more. 20.15% contained an epic item – a few lucky folks managed to find multiple in one box – and just 5.37% contained a legendary item. We didn’t see anyone get more than one legendary per box, though. It’s unclear if loot chests are weighted as a whole or each item is weighted individually. This weighting is a result of Blizzard’s system where nothing is completely random – you’re guaranteed to get a legendary item …eventually. They’ve not explained quite how this works, but we can make some good guesses. This is Heroes of the Storm’s ‘pity timer.’ It prevents the almost-but-not-impossible scenario of just never, ever getting legendary items due to repeated bad luck. If you’ve not been doing great legendary-wise, a box’s contents will have its odds put in your favour. This throws a little uncertainty into the mix. When analysing PTR data, we saw the highest streak of boxes opened before a legendary hit as 17, two separate players fitting this model. With the 2.0 update hitting live servers, we saw multiple people go over this. Some people had previously opened boxes off-camera, but there were four separate occasions where a player would open 33 boxes without a legendary item, with the 34th containing one of those magical golden tokens. We’ve covered both Overwatch and Hearthstone’s pity timers before and if Heroes of the Storm’s is at 34, it puts the game’s timer at higher than Overwatch’s but lower than Hearthstone’s. Folks who have played the game prior to the 2.0 update should get a large chunk of epic chests when they log in, and if that’s you, you may have already opened yours. You can also get them at certain level intervals, but they’re meant to be big rewards, and so are unable to purchase in the shop. We have, though, got some data on how they work. They will give you at least one epic or better item, with the other three items being independently rolled. The minimum, therefore, is three common items and an epic. However, that will still only happen 35.66% of the time, 64.34% of the time you’ll get something better. Because one item is guaranteed to be an epic, the number of common and rare items you find drops somewhat significantly. We used a sample size of 244 for the loot chests, and found that only 55.12% of items were common, compared to the 71.98% in regular loot chests. Similarly, only 15.57% of items were rare, an almost 6% drop in rare items. Legendary item drop rates were decreased too, but only by about 0.1%, to 1.23%. These statistics primarily reflect the smaller number of items that can be common or rare. If we take out those guaranteed epics or legendaries out, we get 73.49% of items as common, which correlates to the data for regular loot chests. Of the loot chests we studied, the average number of chests used before opening a legendary item, though, was between eight and nine. This is because of the reroll mechanic. Some people chose to just reroll when they found duplicate items, regardless of rarity. We’ll go into the numbers behind why that’s often a mistake soon, but this meant that they could get sometimes higher rarity items without forking out for more loot chests. This comes to the question of when and why you should reroll a chest. The exact answer to this differs from player to player: with Heroes 2.0, gold can only be used for rerolling and buying heroes, so those who own all heroes will be fine to spend gold on rerolls. If you’re saving up, try not to reroll too much. The best times to reroll a chest, though, are when you’ve got the bare minimum from it. If you’ve got a regular loot chest with four common rewards, it’s best to reroll. Assuming each item is weighted equally, each has a 28.02% chance of being rerolled into a higher rarity item. Note that just because there’s four of them doesn’t mean you end up with over a 100% chance of getting something better – the roll of each item is independent from the rest. Statistics feel a bit weird, we know. This becomes an interesting deal with rare and epic loot chests. If you get one epic item and three common items from an epic chest, rerolling will never give you less than what you previously had. Those three common items each have that 28.02% chance to be upgraded, while the one epic has a 1.34% chance to become legendary, and a 98.66% chance to stay the same. The worst case scenario here is that you’ll still have three commons and one epic. There’s a 36.79% chance of this happening, according to our numbers – this gives you whopping 63.21% chance to get something better. That something better is more than likely going to be one of those common items turning into a rare item, but it could get even better than that. When you’re dealing with a regular loot chest and four commons, the odds are even better than that. You’ve got a 26.83% chance of sticking at just four common items – 73.17% of the time, at least one item will be upgraded to something of a higher rarity. If the pity timer effects rerolls as well, this percentage will be higher, but Blizzard aren’t sharing their algorithm. With the first reroll of a chest only costing 250 gold, you’re usually better off rerolling if you received the bare minimum. While rerolling epic chests is more expensive (500, then 1,000, then 1,500), we still feel it’s worth the gold – more on that down below. If you’re rerolling a veteran chest, it’s even more expensive, 750 gold for the first reroll, 1500 for the second, and a whopping 2250 for the third. Rare chests, though, still just cost 250 gold to reroll, just like regular look chests. On top of everything else, there’s now Shards in Heroes of the Storm, which function like Hearthstone’s dust or Overwatch’s credits. 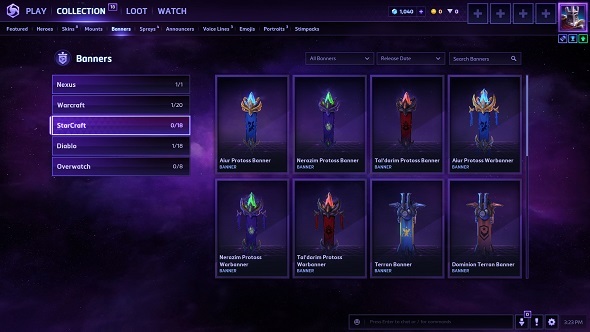 When you get a duplicate item, it will be turned into shards, which can be used to directly purchase cosmetics. A legendary duplicate rewards 400 shards, an epic, 100, a rare, 20, and a common will reward you with a measly 5 shards. If you want one thing in particular, this is the way to go about it: they can be traded in for specific items. You’ll get shards over time, but it’s best not to worry about them too much. 4 duplicate legendaries give enough shards for a new legendary – you’re not rewarded greatly for finding duplicates. At the same time, it’s best not to turn your nose up at them. Rerolling a legendary duplicate isn’t worth it, as it gives you enough to purchase an epic item. The chance of rerolling and getting an epic or legendary item in the duplicate’s stead is very low. Instead, use your rerolls in the situations described above, where you’ve received the bare minimum a chest offers. If you get an epic item and three common items from an epic chest, it’s worth rerolling regardless of if it’s a duplicate (unless, of course, your aesthetic demands it). When the system goes live, take note of what you want, and what you’re looking to spend, both in real money and in-game gold. To maximise the number of rarer items you get, use the gold you’re willing to spend to make the most out of your chests by rerolling those ones that give you low results. It’s also important to note what you’re more likely to find as the limiting factor in opening chests and rerolling them. It’s hard to know exactly what that is yet, as folks haven’t had a long time to get into them with the game’s revamped experience system, but there’s a few key things to consider. Gold is, now, only used for heroes and rerolls. This update has also taken away one way of getting gold – Brawls no longer reward players with 1000 gold, but a loot box instead. If aesthetics aren’t your thing, but having a large pool of heroes is, gold is way more important. While rerolling those bare minimum chests will net you better items it’s not a reliable way to increase your hero pool. And while having that sweet Kerrigan skin will definitely make you a better Kerrigan player (it won’t), having more heroes gives you much more variety in what you can play, both for fun and competitively. On top of that, a new hero is a great opportunity to get a few loot boxes, as you’ll get in levels with them fast at first. If you’ve not opened your batch yet, there’s no rush – you can always play some games before opening a box to build up a bank so you’ve got enough cash to reroll later. Blizzard have also announced they’ll be giving away free “mega bundles”: curated batches of heroes for a specific role. 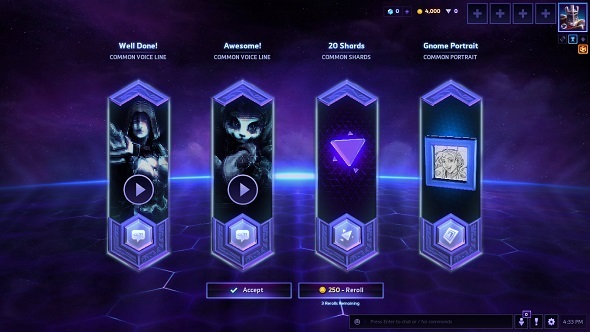 Every player that logs in to Heroes of the Storm by May 22 will be given the option to buy one of four bundles, each of which contains 20 heroes. There’s a quiz to help you decide which bundle to choose, and the Reddit community has a guide for League of Legends or Dota 2 players who want to play something familiar. Thing is: the bundles aren’t of equal value. If you’re really trying to save your gold, pick the Assassin Bundle. This one has a value of 145,000g, the most of them all. The Flex Bundle is worth significantly less at 123,000, the Support & Specialist Bundle comes in at 131,000, and the Tanks & Bruisers bundle is second-highest at 141,000. If you really are desperate to ensure you’re efficient with the gold in-game, the Assassin Bundle is the best value. That said, if you’re not the sort of person who enjoys assassins you won’t get much out of it. This is primarily a heads-up for those of you trying to be as efficient as possible! 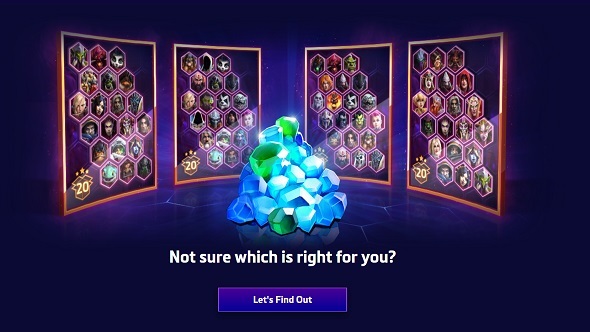 As a final note – the community over on the Heroes of the Storm subreddit have been putting together their own findings. Their numbers seem to correlate with ours quite well, despite having completely different sources. The more data, the better the results, and the fact that our numbers fit means we’re pretty confident in all of this. Before the stats nerds come for us: yes, values have been rounded to two decimal places, and yes, a larger sample size would be better. 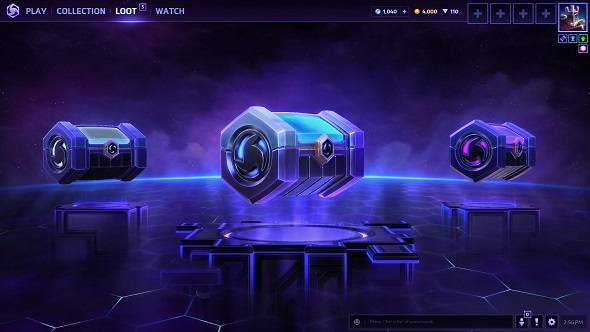 There will be some difference between what people get, but, 500 loot box openings is enough to gauge the system.We’ll revisit if Blizzard update the system, or release these details on May 1st when Chinese regulations comes into play.